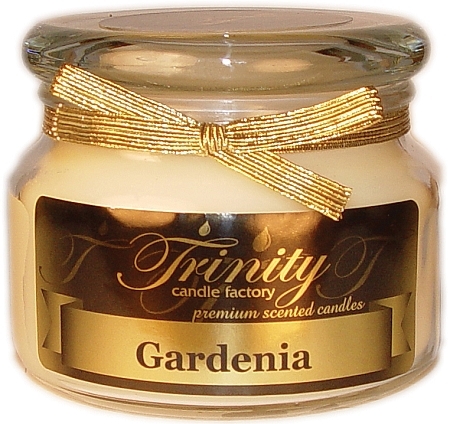 Trinity Candle Factory Premium Scented Gardenia Candle - Traditional - Soy Jar Candle - 12 oz. This Traditional style jar candle comes in all fragrances, premium scented for maximum fragrance throw. With a 80-90 hour burn time, cotton wick and premium scent. This Gardenia fragrance smells just like the gardenia flower. A floral faorite. Really Nice! 100% Satisfaction Guarantee. Gardenia - Fragrance Oil - 1/2 oz. I won this candle from Trinity Candle Factory. I just wanted to take a moment to say how pleased I am with this candle. I love how it is slower burning than other candles and it also has 2 wicks so it burns evenly. It also is very fragrant and smells a room up so nicely. I really recommend Trinity Candles to anyone looking for a great candle, thanks!